We’re happy to announce that Like Computing has entered the market! Like Computing is the IT Managed Service division of Like Technologies, now offering top-tier support to small to medium businesses in the local area. With vastly experienced IT engineers, Cyber Essentials Plus accreditation and BCS membership, you can be sure that our services are of the highest quality with safety and security as our top priority. Whether you’re looking for extra IT support or for a full business IT package, we can provide bespoke solutions and unrivalled expertise. 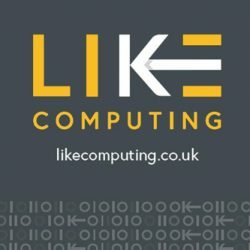 Visit www.likecomputing.co.uk for more details!